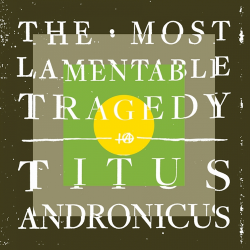 In the realm of Fucked Up’s David Comes to Life (2011), there is now Titus Andronicus’ The Most Lamentable Tragedy. A rock opera at it’s core, the album roars through with badassery at every turn. Concept albums are nothing new for this New Jersey-based band. 2010’s The Monitor was themed on the US Civil War. But The Most Lamentable Tragedy takes it to another level. As a triple album, there are multiple “Acts.” Emotions cycle in and out. There is a lot of interesting instrumentation and arrangement. Stickles’ voice is as memorable as ever. The juxtaposition of difficult subjects with beautiful melodies that makes this an interesting album. “Come on, Siobhan” has harmonic piano and horns. “Fatal Flaw” is another one of those radio friendly tracks with the catchy repeating lyric “Let me show you my fatal flaw.” Stickles embraces the chaos and his own weaknesses. “Dimed Out” is one of the album’s most frantic songs. (A quick urban dictionary search defined “dimed out” as the act of telling on or exposing someone). Stickles yells the lyric, “I only like it when it’s dimed out” over and over again, as to let people know what he is all about. “(S)HE SAID/ (S)HE SAID” is another standout track during the last portion of the album. After an enjoyable cover of The Pogues “A Pair of Brown Eyes,” the album winds down and the listener is left in a state of disarray. It was quite a journey. After listening to the album dozens of time, I think this could’ve probably been a regular 15 song album instead of a 29-track triple album. There are moments of filler like a melodically moody version of “Auld Lang Syne,” “More Perfect Union,” and track of dead air called “intermission.” Both give the listener a breather from chaos. However, they really went for it. The band executes a personal story that is as raw as it is poetic. They upped the ante and it paid off.